Getting involved… well, I started a bit late and joined in at week 2, I think. I was curious mostly – that’s why I thought I’d get involved. I had a look around and decided not to use facebook, mainly because I don’t, and instead follow the conversation on Twitter and blog posts. I started doing some drawings and posts myself when I found I wanted to make my own voice heard, which I enjoyed. Being in the open… was a mixed experience for me. On the upside I made some great connections, found a lot of interesting things and got very generous feedback and comments. Confidence building and stimulating on the whole. However the kind of open conversation and thinking can be hard to get into when day to day your work isn’t like that and it took me some time to find the right space in my day and in my head to engage with what was going on. Being a learner on an equal footing… is probably what I found most difficult. In my day to day work I don’t often get to give feedback or collaborate with others as a peer on an equal footing and being a learner #rhizo15 made me more aware of my own mindset and how valuable it is for me to switch my perspective. That leads me to my last point, which is …not knowing things. Both the format and topic of this course were interesting in this respect and I enjoyed not knowing things, the freedom that this kind of approach brings with it. Thank you… like many of the other participants that have reflected on their experience of this course I feel mine has been profound for me and my open practice. I am deeply grateful to have been part of it and I am also pleased to have made the effort to engage. It somehow brings to mind the game invented by Mary Poppins to tidy up the nursery, Well Begun is Half-Done. Having made a start, I’ve gotten further down the path than I had anticipated. It’s always good I think to end up somewhere you didn’t plan to go – and that has certainly been my #rhizo15 experience. This weeks post for #rhizo 15 is all about making time and finding your own way. Or it’s all about one of my favourite stories. The story I am thinking about is a short book published by Michael Ende, author of the Neverending Story, in 1973. The book is called Momo (and you can find some information about it on Wikipedia). The main character in the story is a girl called Momo, but the character I like best is a tortoise called Cassiopeia. It’s s special tortoise. It can make words appear on its shell and it can see a little ahead into the future. But in the story it also uses its innate slowness to navigate through the adventure at is own deliberate pace. How does this connect to being part of #rhizo15 things? Well – this week’s prompt, about building a practical guide, made me think about what I found most challenging about trying to participate and the two things I came up with were finding time and deciding on the pace and direction of my journey. In the story Momo’s world is shaped by the frantic pace of the grown ups around her. Efficiency rules progress, time for stories, listening and caring disappears. Her fight against the the ‘Grey Gentlemen’ (who steal time) can only succeed with the help of the tortoise. Together they walk slowly, carrying their own time with them through the city on their adventure. In many ways that is what I have been trying to do, to set my own pace, to make my own rate of engagement slow down and to create space for things which are hard to do when you are in a hurry. By trying to discover things at tortoise speed I’ve probably missed a lot of interesting things and conversations which I would have found valuable. But at the same time the freedom to take things slowly has stopped taking part from becoming an item on my mental to do list. Instead I have imagined those weekly prompts or ideas that I have come across as messages appearing on the back of my tortoise – and used them as a hint, a trail to follow. For me, that’s been what I wanted out of this experience more than other things. Space and time to think – sometimes in company. Like an imaginary friend from childhood I am hoping to keep my tortoise as a reminder that I have time and that I am free to decide my own path. P.S. If you haven’t read the book, I would wholeheartedly recommend it. 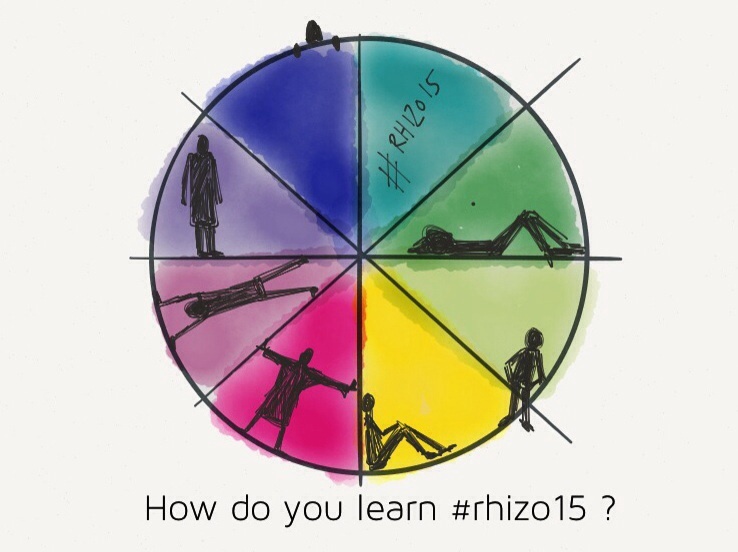 How do you learn #rhizo15? This week I am not going to write much on community/conformity. Instead I’ve decided to read, comment and reflect on what is being contributed across the community – to help me think and draw about my own question for this week: ‘How do you learn #rhizo15?’ . This week I want to use an example from Anthropology think about space, method and discovery in learning. For that, I’m going back to draw on a subject about which I actually know more about than most people: cemeteries. 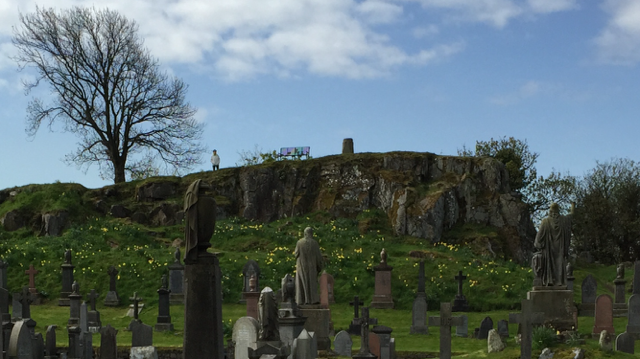 It’s #rhizo15 thinking using the spatial and conceptual metaphor of Victorian cemeteries in Britain. So, the prompt this week was getting me to think about the role of a teacher/facilitator or similar (appropriately this seems to coincide with “Thank a Teacher” week, which I hadn’t come across before) in different learning contexts and in particular in rhizomatic learning. 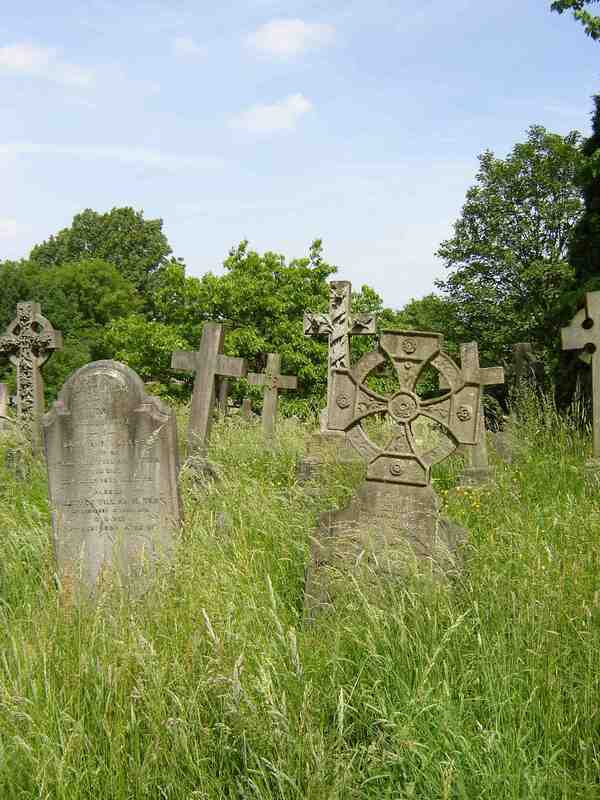 Some of the most well-known Victorian cemeteries are located in large cities such as London or Glasgow. Highgate Cemetery in North London is a particular favourite with visitors as it’s the burial place of many well known people including Karl Marx. But regardless of ‘dark tourism’ – which is becoming an increasingly popular activity – the principles on which cemeteries were built in the 19th century shared elements with learning landscapes. They had indeed an educational mission of their own, constructed with practical as well as educational functions. 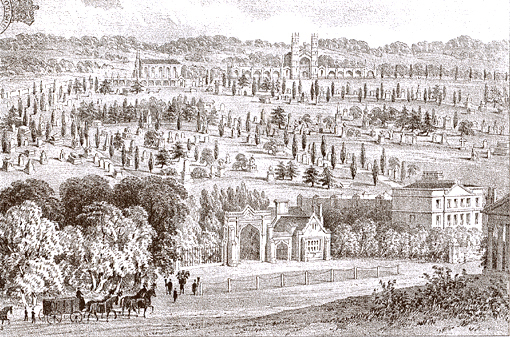 While their primary function was to provide a place of disposal for the dead, cemeteries were also educational resources, usually constructed according to elaborate landscaping themes influenced heavily by theories around the picturesque and enlightenment. For example, paths in a cemetery were often arranged in a pattern that drew visitors into the innermost part of the cemetery, leading them along a gently spiraling path usually to the highest, most central point of the site. Once you arrived at this elevated vantage point the view was intended to be significant, usually affording you a perspective that included a church or similar landmark. In London this was often Christopher Wren’s St Paul’s Cathedral. At any rate, the cemetery’s layout, expressed through paths, rows of graves and planting schemes, was designed to give visitors a sense of exploration and discovery, while at the same time guiding them, drawing them into, a narrative of moral and social dimension. Walking along the main path you would see first and foremost the most spectacular monuments, usually with inscriptions that highlighted values such as a strong faith, worldly success, family, social status etc. You would also see the natural elements of the space closely kept in check by man. And at strategic points there would be a bend in the path creating a sense of surprise at the view suddenly encountered, intended to prompt visitors to wonder, to think of higher things than their daily existence. Not unlike a learning experience we might design online or in a blended environment today, the act of visiting a cemetery for your usual Sunday afternoon walk, was an orchestrated experience in Victorian Britain. It didn’t involve a guide as such, but all the elements, the landscape, the paths, the monuments, the inscriptions and the view came together to produce a particular experience/learning process. Cemeteries weren’t just libraries carved in stone, repositories of memory. They were and are learning spaces that were designed to be experienced on foot, to give the visitor a clear sense of where they may fit in the social and moral order of things, to aspire to the example of their betters and to be proud of/curious about those who left the largest, most impressive marks of the existence behind. I am pretty sure you could draw some interesting conclusions in regards to the pastiche of architectural styles used in Victorian monumental masonry, from ancient to futuristic, but we’ll skip that for now. In short, the traditional visit to the cemetery is a very rigid learning experience that doesn’t need a ‘teacher’ because the space itself fulfills that role. On the other hand, many of the Victorian cemeteries that stood splendid a century ago are now in ruins. Their spaces turning from public exhibitions of the mastery of religion, art and gardening over nature and ultimately over death to romantic landscapes of decay and testaments of change. We have grown ignorant of the visual and spatial languages they used to communicate their message, the values of the society that created them. More of than not, they become visual curiosities or tourist attractions or most often inconvenient pockets of space that stand in regulatory opposition to progress and development through their sheer existence (you will always find it difficult to develop land that still has grave markers on it after all – even in a city like London where every square inch is at a premium). Today the most common way to experience a popular Victorian cemetery is on a tour conducted by volunteers. Volunteers who are usually very knowledgeable about the history, the individual ‘inhabitants’ and the original architecture/planting scheme/sculptures. They try their best to translate the significance of the space for us, to re-create not the moral lessons, but the historic content of the cemetery. They act as a teacher, a guide to the past. In contrast to the volunteer led tours, one of the experiences I found most valuable was to explore one of the most famous Victorian cemeteries in London at the side of one of its employees, a grave digger and guide par excellence. You might think that sounds a little gruesome. Most people don’t like to think about what grave diggers do. But someone who works with the land, who knows every inch of it, who can show you the hidden paths, the secret spaces the guided tours don’t come across, is the perfect guide. In my case I learnt that when you leave the intended path, when you stop following the traditional patterns of experience, you can discover a whole new perspective. Following his shortcuts we discovered new elements of the space, wild flowers, rare butterflies, protected birds, that had started creating a new order of things in the cemetery. A new experience that communicated very different values to those originally intended. Instead of religious faith, nature had taken over. In place of a path of enlightenment the cemetery has provided a refuge from the industrial, urban reality of 21st century London. This new purpose of the space I wouldn’t have discovered without my guide. He taught me what to look for, where to step – how not to fall into a hole left by a collapsed burial chamber. To get back to #rhizo15 and this week’s prompt, I’m interested in how we can create different ways of learning and teaching, some which can be more independent and some which are guided. The internet is an exciting space of ever evolving possibilities when it comes to learning and allows us to experiment with complicated simultaneous learning journeys all happening alongside each other in the same space. Thinking back to my post from last week, when I was thinking about curiosity and content, I think that discovery, whether it’s independent or guided, is still one of the things I am most interested in. In that spirit, I’m finishing this week with a picture of something I discovered in a cemetery this week in Stirling in Scotland. This week’s prompt from Dave Cormier on the ‘Myth of content. Content is people’ and the conversation that I’ve been trying to follow #rhizo15 has got me thinking about who decides on content, what it is, how we package it, how it is delivered, consumed, shared… . Day to day the aspects of ‘content’ I deal with most are how it is created, licensed, mapped against accreditation frameworks, quality assured and so forth. There are many different ways in which to define it, how it is delivered and funded, who creates it, who decides what is included or left out and also what purpose it serves, whose criteria it meets. This is a political, ideological and economic process before anyone gets to thinking about learning. What I am particularly interested in is how content, however broadly defined, can develop curiosity. How what or how we learn and teach can result in questions and discovery. Not just for those who already know how to be curious, but for everyone. 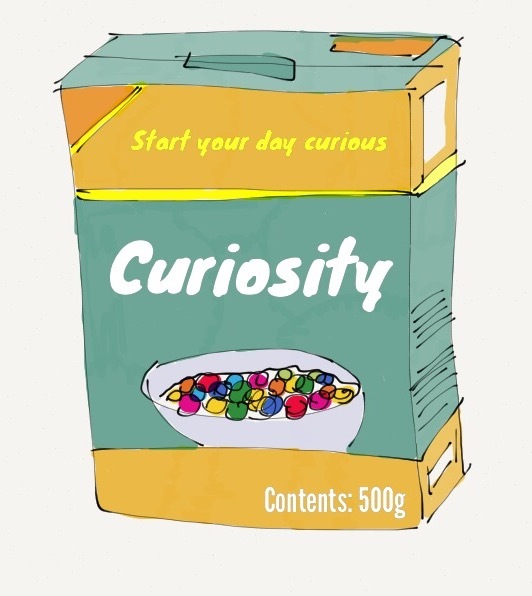 Instead of the ‘truth box’ that contains everything you need to know to pass the next exams or get through a day at work, I’d like a box full of curiosity (see drawing for the cereal version…). Online, content that is open(ly licensed), content that you can find when you are looking for it, share, re-use and integrate into the story, into what you learn, makes being curious much more rewarding. That’s one reason why large scale efforts to organise information, to make it discoverable, are so powerful. From one learner on a single course the right question can zoom you out to think at the scale of the entire world. Being curious makes things more interesting, makes us ask more (questions) of content. #rhizo15 week 2: Situationist learning maps? Contributing something #rhizo15 is part of my ongoing effort to become an open practitioner. This week’s topic, learning is a non-counting noun, made me reflect on how my own ideas of how we can count, measure or track aspects of learning developed. Unlike most people who spent a lot of time in Higher Education my experience of studying and later infrequently teaching at university didn’t involve many written exams or a set curriculum. First Fine Art and then Anthropology were disciplines that afforded me enormous freedom. In the first case progress was charted by the sketchbooks filled, pictures taken, materials purchased and objects made. These units of measurement translated the ongoing process of thinking and making into external, visible signs of activity. There was no set path or goal instead we had open, critical discussions and at times the results of months of work was deemed to ‘work’, to be successful, to have meaning. Anthropology meanwhile, while requiring more specific reading and skills, is such a conceptually broad discipline that it was impossible to find something interesting that wouldn’t be relevant. Here milestones came in the form of distances travelled, time spent ‘in the field’, interviews transcribed, maps made and diaries kept. Yet the ultimate aim of all the work was a particular quality of understanding, of knowing what it’s like to see the world through someone else’s eyes, of interiority. ‘True success’ as an Artist or Anthropologist depended on ongoing practice using tools that could be supplied, techniques that could be taught, but ultimately defied clear definition or indeed measurement. Instead of content, there was practice. Instead of grades awarded or exams passed, there was an ever growing debris of objects and information that together served as a physical record of the process of learning. The reason for why one artwork ‘worked’ while another one did not or how one of us achieved a real sense of their particular subjects in the field could never be more than guessed at, let alone measured. Not unlike the way in which members of the Situationist International movement used what they termed ‘drifting’ as a new way to explore and chart a city (Simon Sadler’s The Situationist City is always an interesting read), making maps of spaces according to a different set of priorities and experiences than geographic maps for example, learning (journeys) can be charted in different ways. One of the challenges we face is being flexible, creative and curious enough to be able to value aspects or ways of learning that don’t fit into an existing pattern we already know about. To map or count learning not only in ways we can already understand, but leave space for the things we don’t. Situationists, Sherlock and secrets. Thoughts for #rhizo15, on learning as a non-counting noun. 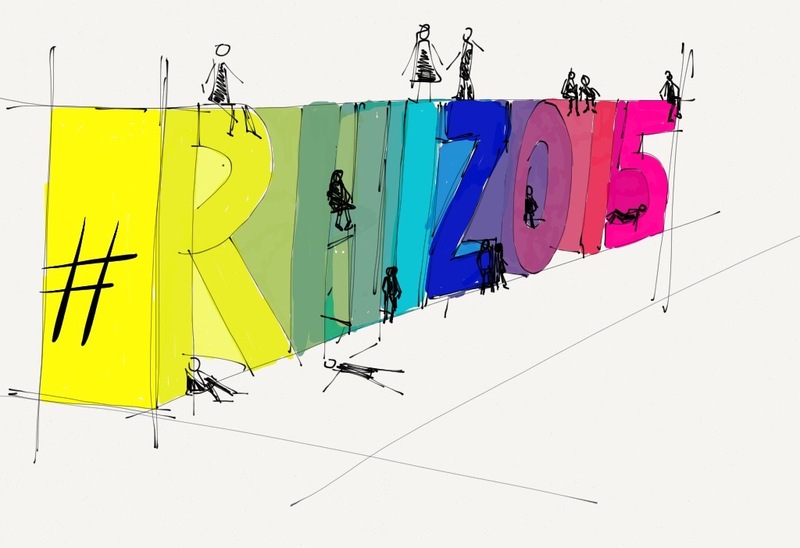 For me, contributing #rhizo15 is part of an ongoing effort to become an open practitioner. This week’s topic has made me think about a lot of different things, including how my ideas about learning have developed and how some of the technologies I now work with could be applied to things which at first glance might not be easy to track or measure. At university I became curious about Situationism. The Situationists I was interested in were a small group of people gathered around Andre Gide who in the 1920s tried to experience the world, in particular the city of Paris, in a new way – by what they termed drifting. Simply put instead of following a map or grid to navigate the city, they would walk on foot following no pre-determined pattern, instead allowing the currents of their own minds and experiences to determine their path and speed – drifting on the currents of their city. Some of the results of this kind of practice were maps, depicting a city from a different perspective. In short they produced data that allowed us a glimpse of their city, their experience of it. I imagine that Situationists today could use things like Google Glass to help record their experiences (even if it would presumably result in a lot of circular maps and very blurry video footage, alcohol being a key part of drifting). With the tools we have today to collect data we could probably come up with ways to track, measure or count a lot about different kinds of learning, including making, seeing and experiencing things. But the concepts that we’d use to analyise the data we collect would need to be appropriately flexible and complex. Giving a machine criteria to evaluate data of a (learning) journey without an end or aim is an interesting challenge. What I enjoy most about learning is when I don’t know where it’ll lead me. My concept of learning is shaped by my time at university, first on a Fine Art, then Anthropology degree. In stark contrast to those studying sciences or languages, my art degree involved no exams, a very limited curriculum of required reading and two hours of being in a particular room at a particular time each week. Studying Anthropology did involve more lectures, seminars and reading, but by its very nature trying to study our own species has enormous scope with practically nothing I could find being off-topic. In place of content, there was practice. Instead of written exams, there was discussion. What I learnt to value most is being self-motivated, curious and reflective. Skills that still shape what I do and how I learn. During the first few years at university my progress could be measured in units of sketchbooks filled, pictures taken, new methods of making stuff tried out and by the level of mess that my studio space contained. Thinking and making as reflective, critical practice involved leaving a path of debri, discarded leftovers and treasured glimpses of inspiration. What ended up in a clean, white space three times a year for critical evaluation by peers and tutors was only a small part of the whole. Anthropology had its own ways of charting progress or success, most notably distances travelled, days, weeks or months spent ‘in the field’, interviews taped, maps made and diaries kept. As my focus was on material culture, it also included a lot of objects examined, made and catalogued. Both of the subjects I studied at university placed an emphasis on creating a mind-set, a practice, of becoming an Artist or an Anthropologist as a specific way of being in the world. Both were supported by classes, reading, tutors and other mechanisms designed to give you the best possible chance of achieving that aim. And yet, in my experience, both relied on something that couldn’t be counted or measured, but a quality that was priced more highly than anything else. Doing all the right things, reading all the right books, did not compare to achieving it. In Fine Art this was a sense of something working – or failing to work. In Anthropology it was an understanding of what it meant to be in someone else’s shoes, seeing the world through their eyes, of interiority. These mysterious qualities, these moments of everything falling into place, was what all the process, the thinking, reading, reflecting, discussing or doing, led to. Most of the time, you couldn’t explain why it had or hadn’t happened or replicate it. What you took away, if you were lucky, was a method, the tools to help you achieve the same kind of process or understanding again in a different way. When I think about learning and curiosity, two people I keep coming back to are Sherlock Holmes, the detective of the original stories, and Commander Data, the android officer from Star Trek. As childhood heros of mine their stories have coloured my understanding of learning and asking questions. Both rely on observation and deduction and have superior sources of information. Holmes has his own reference works and London’s institutions while Data has the computer on the Enterprise as well as his own database. Both encounter much they cannot initially explain or understand. Both are students of human nature. Each is the ‘hero’ of their own story, their character defined by exceptional abilities and knowledge in contrast with a need for a friend, their struggle with being different. To me, they serve as a useful mental metaphor. Their stories prompt me to ask questions, to be curious. They also remind me to value what I can’t explain and don’t understand or indeed what I cannot count.